Video: Questions for Atheists on their "Morality"
In an exclusive interview with CBC News, Prime Minister Stephen Harper says the biggest security threat to Canada a decade after 9/11 is Islamic terrorism. In a wide-ranging interview with CBC chief correspondent Peter Mansbridge that will air in its entirety on The National Thursday night, Harper says Canada is safer than it was on Sept. 11, 2001, when al-Qaeda attacked the U.S., but that "the major threat is still Islamicism." "There are other threats out there, but that is the one that I can tell you occupies the security apparatus most regularly in terms of actual terrorist threats," Harper said. Harper cautioned that terrorist threats can "come out of the blue" from a different source, such as the recent Norway attacks, where a lone gunman who hated Muslims killed 77 people. But Harper said terrorism by Islamic radicals is still the top threat, though a "diffuse" one. For the rest of "Harper says 'Islamicism' biggest threat to Canada", click here. Strange Searches: You Can't Do That HERE! Buona sera. I just had to throw this one at you. Catch! 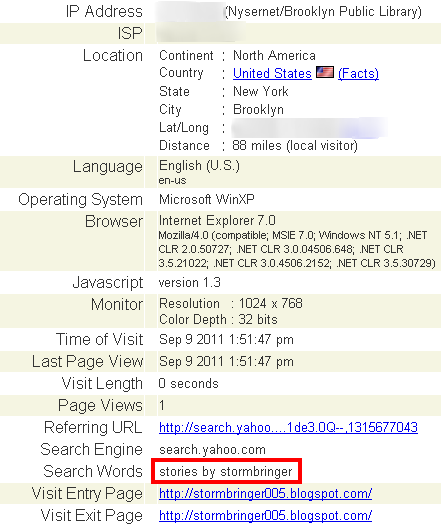 There are several drawbacks to picking the "Stormbringer" moniker. One is that people who are unaware that the world existed and had history before they were born, such as the origins of the name itself. Another problem is that quite a few people use it (notice the URL here, I had to add numbers to the name). One Stormbringer is a purveyor of, uh, "adult" material. I've had quite a few people hit this site looking for his stuff. 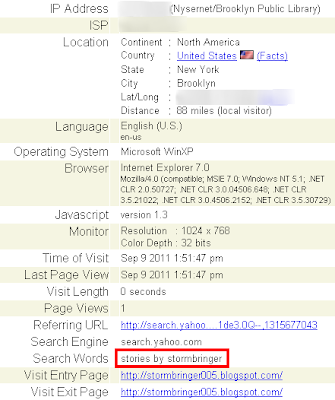 What I found amusing is that someone is looking for the naughty bits from a public library in Brooklyn! Although it says "stories by stormbringer", I don't write stories, I've had many hits from people searching for "a bit of the other", and I know this horndog was trying to find this stuff to read in a public place. Come on, do it at home in the dark or something. The death toll in central Nigeria from an intensified series of violent attacks along religious and ethnic lines continues to rise after reports that Muslim youths killed a Christian family of eight on Sunday. Sometime after the attack on the family, journalists were taken by a Plateau state spokesman to a house in the village of Tatu, where the hacked bodies of the eight family members were still lying on the blood-soaked floor, according to Reuters. It is estimated that more than 50 people have been killed since Aug. 29 when youths identified as Christians attacked a group of Muslims as they gathered to celebrate the end of Ramadan in the city of Jos, capital of Plateau state. Read the rest of "Christian Family of 8 Killed in Nigeria; Death Toll Now 50" here. Today’s terrorist attacks in London, strangely enough, will help Islam grow even stronger. There will be a brief period of outrage against Islam, but once the smoke has cleared (both literally and figuratively), the world will once again rush to defend Islam, and more bills will be passed, "protecting" Muslims from those who would speak out against Muhammad’s "religion of peace." No matter how violent Islam becomes, as long as people fail to recognize that its two faces are part of the same head (and that both faces are calmly smiling as new laws make Islam untouchable), Muhammad’s empire of faith will thrive in a world of false tolerance. Hoo-RAH for the Coming Darwinocracy! In Going Rogue: An American Life, Sarah Palin recounts the vetting process she experienced before she was selected to be the GOP vice presidential nominee in 2008. While being interviewed as a potential candidate for the McCain campaign, all went smoothly until something made the McCain staffers wince. Atheistic evolutionist Richard Dawkins promptly scolded Perry and the Republican Party for its lack of intelligence, particularly in having the audacity to not swallow Darwinian evolution hook, line and sinker. Find out what Richard "Daffy" Dawkins said by reading the rest of Amanda's insightful article entitled, "Darwinocracy: The evolution question in American politics" here. Then, you can read the follow-up article, "Dissecting Darwinocracy", here.